I keep seeing Burberry in the Netherlands. Every eighth person is wearing a hat, a scarf or a coat, even carrying an umbrella, in the sickly-coloured plaid. 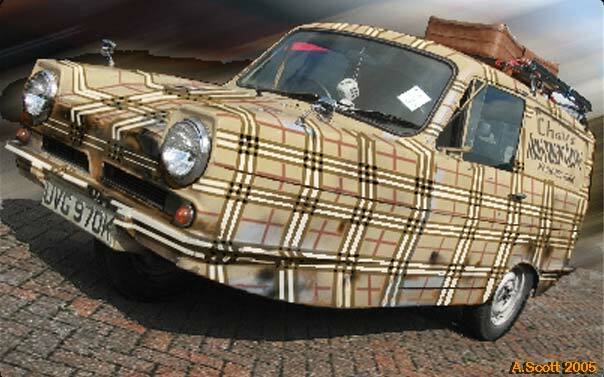 Burberry used to be posh person's gingham but has since become synonymous with Chaviness or Chavnicity. "Chav" is the new word which is currently enjoying a range of uses from people of low means and very poor taste to hooded, drug-doing, petty criminals. I read somewhere not too reliable its etymology is from Chatham a seaside town in Kent. It's similarity to "chaff" can't be discounted. Being (if you buy an original) a pricey brand, wearing Burberry is all part of "bling bling" idea of wearing something expensive to show that you are not actually financially challenged. The effect, of course, is lost when you wear it with a tracksuit or when you step out of a badly patched Ford Fiesta complete with cardboard spoilers. I assume nowadays the sort of people who used to buy Burberry have moved on, and Burberry is now like one of those boroughs in cities that were once prime areas but are now faded and all the big houses divided up into tiny separate flats. Anyway, time to slip into my Burberry pajamas and slip between my Pussycat Dolls bedsheets.